Monel 404 Plates Supplier, ASTM F-96 Monel 404 High Resistant Plates, DIN 2.4867 Monel Hot Rolled Plates Exporter, 404 Monel Cold Drawn Plates Dealer. Marc Steel is a known trader and exporter of Monel 404 Plates,, which contain nickel and copper as the main components. This alloy of copper- nickel is another in the Monel family. ASTM F96 Nickel Alloy 404 Plates has excellent brazing capability and very low magnetic permeability. Monel UNS N04404 Plates has a relatively high copper content, hence is suitable for electric and electronic applications. It is used primarily in specialized electrical and electronic applications. 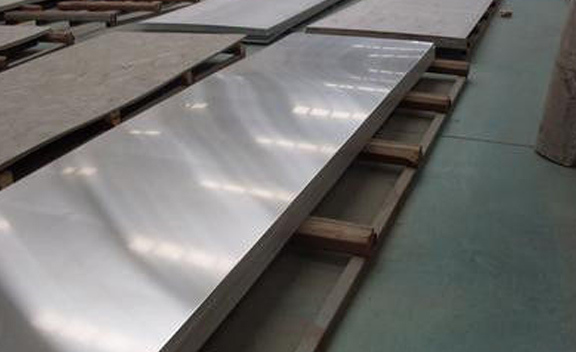 Monel 404 Sheets is often used in electronic and electrical devices, marine fixtures, chemical processing equipment, gasoline tanks, boiler feed water heaters and other heat exchangers. MONEL ASTM F-96 PLATES STOCKHOLDER, CORROSION RESISTANCE MONEL 404 PLATE EXPORTER, UNS N04404 MONEL SHEETS, COLD DRAWN 404 MONEL ALLOY PLATE STOCKIST, MONEL 404 HOT ROLLED PLATE EXPORTER IN INDIA. MONEL 404 PLATES, MONEL 404 CHEQUERED PLATES DISTRIBUTORS, MONEL 404 PERFORATED SHEETS SUPPLIERS, DIN 2.4867 MONEL SHIM SHEETS, MONEL ALLOY 404 PLATE DEALER, ASTM F-96 404 MONEL COLD ROLLED SHEET MANUFACTURER & SUPPLIERS. Monel Alloy 404 Coils has low permeability, good brazing characteristics, high strength, and extremely corrosion resistant. However, the composition of Monel Alloy 404 Sheets is carefully adjusted to provide a very low Curie temperature, low permeability, and good brazing characteristics. Nickel 404 Plates has good strength, toughness excellent resistance to many corrosive environments. The content of the elements that make up the Nickel 404 Sheets is adjusted such that the alloy has a very low Curie temperature, low permeability and good brazing characteristics. Nickel 404 Coils is a nickel-copper composition in which residual elements are held to low levels, to provide a clean, wettable surface to the brazing alloy even after continued exposure to wet hydrogen. Conventional machining techniques used for iron based alloys may be used. This Monel 404 Coils does work-harden during machining and has higher strength and “gumminess” not typical of steels. Buy Monel Alloy 404 Plates at reasonable price from us. United Kingdom, Turkey, Libya, Thailand, Afghanistan, Morocco, Vietnam, Switzerland, Singapore, Chile, Chile, South Africa, Trinidad & Tobago,Tunisia, South Korea, Philippines, Ireland, Bangladesh, Kenya, Belarus, Azerbaijan, Hong Kong, Nepal, Kazakhstan, Jordan, Hungary, Bolivia, Namibia, Macau, Kuwait, Croatia, Gabon, Serbia, United States, Denmark, Oman, Malaysia, Japan, Indonesia, Austria, Norway, Iraq, Iran, Zimbabwe, Angola, Qatar, Romania, Peru, Greece, Tibet, India, Argentina, Gambia, Italy, Estonia, France, Ecuador, Spain, Costa Rica, Ukraine, Netherlands, New Zealand, United Arab Emirates, Poland, Sweden, Czech Republic, Bahrain, Iran, Nigeria, Finland, Sri Lanka, Lebanon, Bulgaria, Egypt, Germany, Bhutan, Mexico, Belgium, Brazil, Yemen, Pakistan, Puerto Rico, Israel, Canada, Venezuela, Portugal, Poland, Mongolia, Ghana, Slovakia, Australia, Colombia, Russia, Saudi Arabia, Nigeria, Taiwan, Lithuania, Algeria, Mexico, China. Cairo, Doha, Dammam, Houston, Toronto, Navi Mumbai, Courbevoie, Abu Dhabi, Los Angeles, Caracas, Gimhae-si, Edmonton, Brisbane, Thiruvananthapuram, Chiyoda, Ulsan, New York, Rio de Janeiro, Jeddah, Ankara, Bengaluru, Muscat, Lagos, Howrah, Indore, Secunderabad, Pimpri-Chinchwad, Pune, Bhopal, Sharjah, Ahmedabad, Bangkok, Kolkata, Calgary, Chennai, Kanpur, Kuala Lumpur, Tehran, Madrid, Mexico City, Bogota, Coimbatore, Al Jubail, Thane, Lahore, Aberdeen, Surat, Seoul, Dallas, Riyadh, Vadodara, Dubai, Ranchi, Jaipur, Hanoi, Port-of-Spain, Sydney, Gurgaon, Vung Tau, Ahvaz, Baroda, Manama, Nashik, Chandigarh, Hong Kong, Visakhapatnam, Faridabad, Moscow, Noida, Nagpur, Algiers, Ludhiana, New Delhi, Singapore, Geoje-si, London, Kuwait City, La Victoria, Mumbai, Melbourne, Hyderabad, Atyrau, Perth, Colombo, Jamshedpur, Montreal, Petaling Jaya, Karachi, Ernakulam, Granada, Rajkot, Jakarta, Milan, Istanbul, Al Khobar, Haryana, Ho Chi Minh City, Santiago, Busan.